Common Name: Tendrilled fritillary bulb. Part Used & Method for Pharmaceutical Preparations: The bulbs are dug in summer and dried in the sun. The bulb bark is removed. Properties & Taste: Bitter, sweet and slightly cold. Functions: 1. To moisten the lungs and resolve phlegm; 2. To stop cough; 3. To clear heat and release nodules. 1. 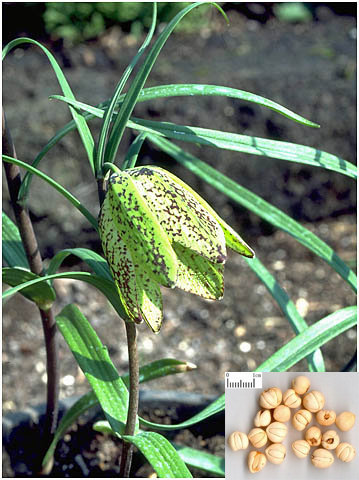 Cough: a) chronic cough due to lung deficiency manifested as dry cough and dry throat Tendrilled fritillary bulb (Chuanbeimu) is used with Ophiopogon root (Maidong) and Glehnia root (Shashen); b) phlegm-heat cough manifested as yellow and thick sputumTendrilled fritillary bulb (Chuanbeimu) is used with Scutellaria root (Huangqin), Anemarrhena rhizome (Zhimu) and Trichosanthes fruit (Gualou); c) wind-heat coughTendrilled fritillary bulb (Chuanbeimu) is used with Mulberry leaf (Sangye), Peucedanum root (Qianhu) and Apricot seed (Xingren). 2. Scrofula, mastitis and lung abscess: a) scrofula Tendrilled fritillary bulb (Chuanbeimu) is used with Scrophularia (Xuanshen) and Oyster shell (Muli); b) mastitis Tendrilled fritillary bulb (Chuanbeimu) is used with Dandelion herb (Pugongying) and Forsythia fruit (Lianqiao); c) lung abscess Tendrilled fritillary bulb (Chuanbeimu) is used with Houttuynia (Yuxingcao) and Coix seed (Yiyiren). Dosage: 3-10 g, ground into powder and taken with water, 1–1.5 g each time. Cautions & Contraindications: This herb cannot be used with Sichuan aconite root (Wutou), as they counteract each other.